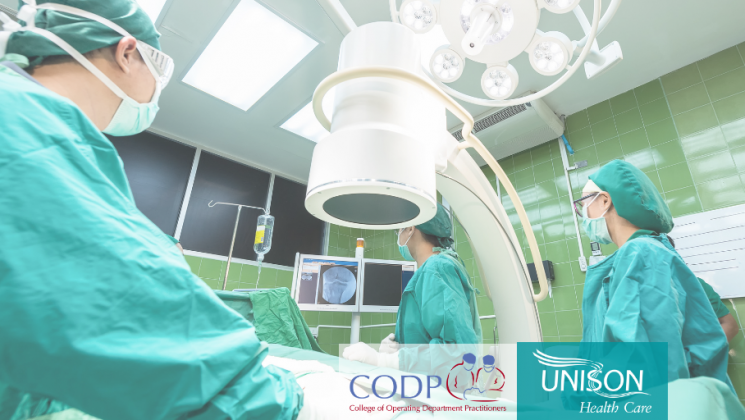 The College of Operating Department Practitioners is the professional body for Operating Department Practitioners (ODPs) – ODPs are registered Allied Health Professionals and are regulated by the Health and Care Professions Council (HCPC). The College provides support and advice to its members and represents ODPs in aspects of professional, educational and workplace matters. The College has membership on national committees, advisory groups and responds to consultations set by government and other professional and registrant bodies. ODPs are highly skilled and essential members of the surgical team who care and support patients during their operative procedures. The role of the ODP essentially covers three interconnected phases of perioperative care, the anaesthetic phase, the surgical and the post-anaesthetic care phase. How do you become an ODP? After successfully completing a pre-registration ODP programme, it is necessary to apply for registration with the Health and Care Professions Council in order to use the protected title of ‘Operating Department Practitioner’. CODP is part of the Science, Technical and Therapy (STAT) occupational group of UNISON. ODPs and student ODPs can receive advice and guidance on professional issues from members of the CODP Professional Council while at the same time enjoying the full benefits of UNISON membership, such as indemnity insurance, workplace representation and access to legal representation on employment issues. For ODPs working in higher education, membership of UNISON might not be the most appropriate union. For this reason, ODPs who are members of the University and College Union (UCU) can be members of the College through the reciprocal agreement between UNISON and UCU. Please ensure that you state Operating Department Practitioner or Student ODP as your occupation so that the College can better serve you. If you are an ODP and a member of the University and College Union please contact us by emailing CODP@unison.co.uk. Unfortunately, the wider UNISON member benefits are not available to you, these will continue to be provided direct by UCU. If you are permanent member of Her Majesty’s armed services (not a reservist) and wish to seek professional advice from the College we recognise that you are not able to be a member of a trade union and so the Professional Council will continue to provide advice on professional issues to you directly. A working group comprising organisations from across a range of health and social care sectors (including the College of Operating Department Practitioners) has launched a set of principles for continuing professional development (CPD) and lifelong learning. The principles are designed to guide individuals, employers and wider systems to create a culture of continuous improvement, workforce development and improve outcomes for service users. People working in the health and social care workforce operate in a changing, challenging and complex environment. Practising safely and effectively, now and in the future is essential. An A5 leaflet outlining the role operating department practitioners play in patient care. Aimed at other NHS staff and the public. An A5 leaflet designed to help with the recruitment of ODPs into UNISON.